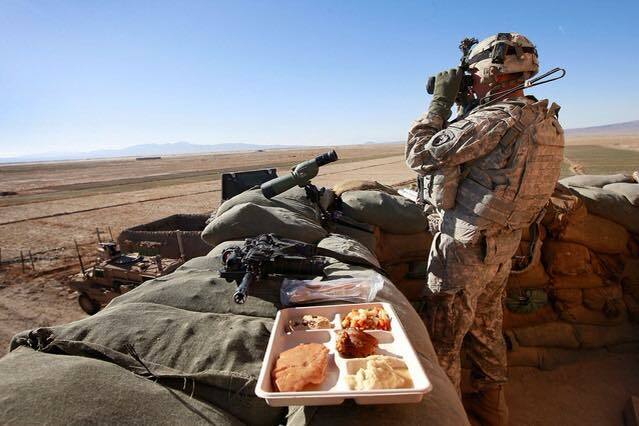 Thanksgiving is a unique time of year when the phrase “comforts of home” means something very specific to America’s troops and their families: a full turkey dinner with all the fixings. 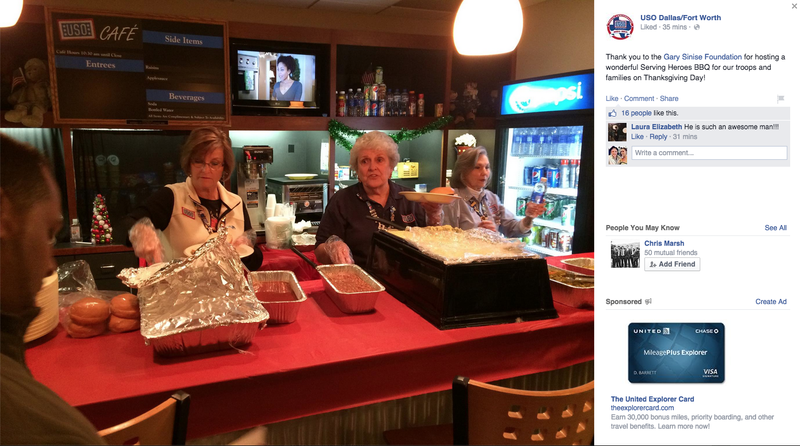 It’s also one of those moments when you can see the full breadth and reach of the USO and its volunteers. Come along on a journey with us, from Kaiserslautern, Germany to Kandahar, Afghanistan to San Francisco to witness the true heart and passion of the USO in action – generous Americans working together with the military to bring the simple comfort of a Thanksgiving meal to our troops and their families wherever they may be stationed. 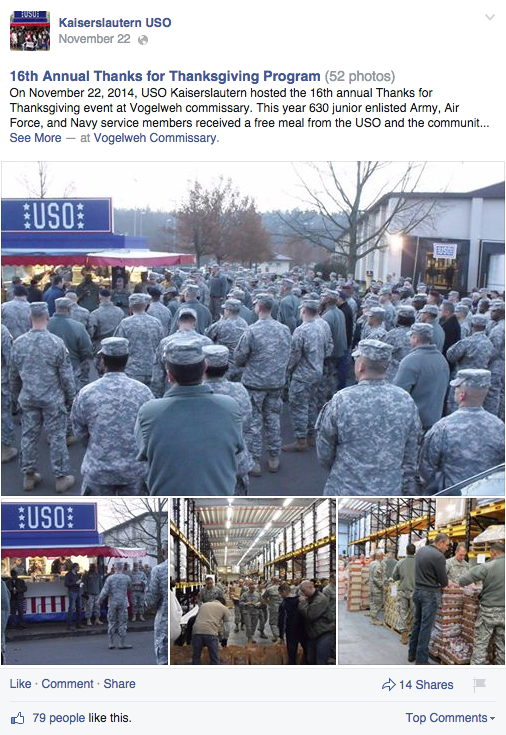 On Nov. 22, USO Kaiserslautern hosted its 16th annual Thanks for Thanksgiving event at the Vogelweh commissary. 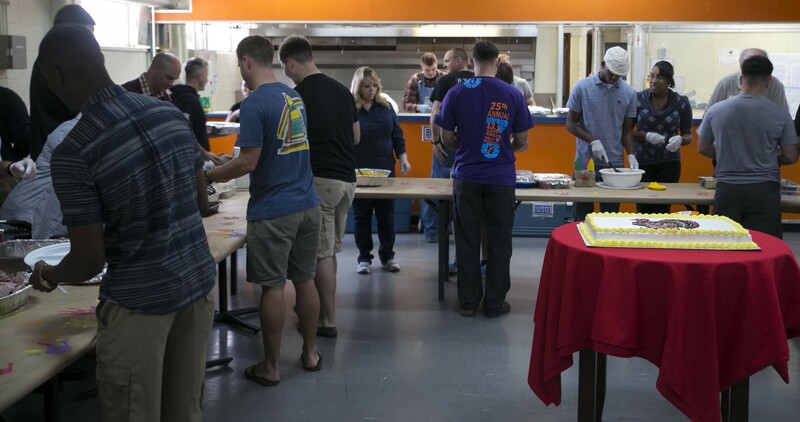 This year, 630 junior enlisted soldiers, airmen and sailors received a free takeout meal from the USO and the community as a way to thank them for their service. Each meal consisted of a turkey, roasting pan, pie, dinner rolls, stuffing, gravy, mashed potatoes, peas, sweet potatoes and cranberries. 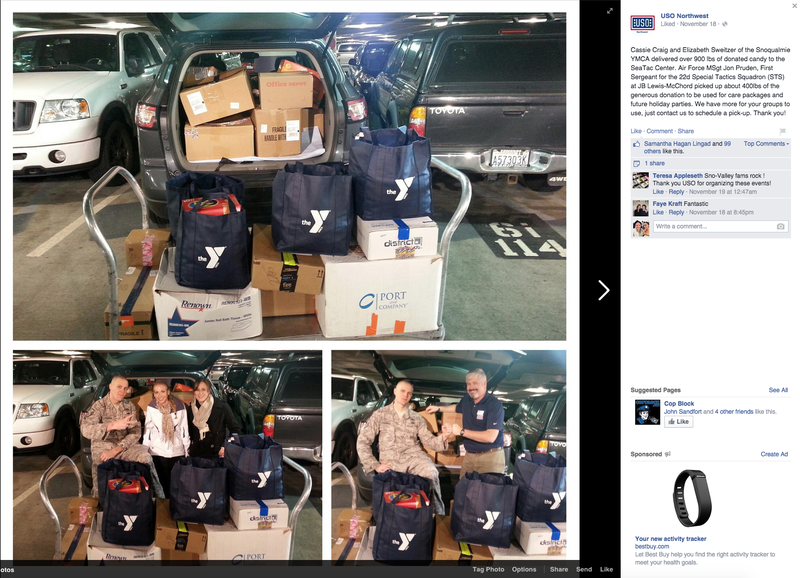 Each service member attendee also received a $25 gift card from Service Credit Union to purchase additional food items, a 100-minute calling card, a Stars and Stripes newspaper and Disney DVDs for the kids. 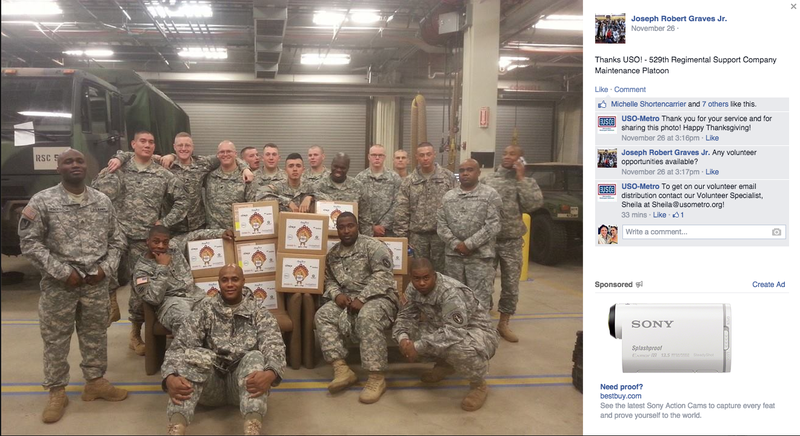 All of the meals were bagged up and handed out by Army and Air Force enlisted leadership. 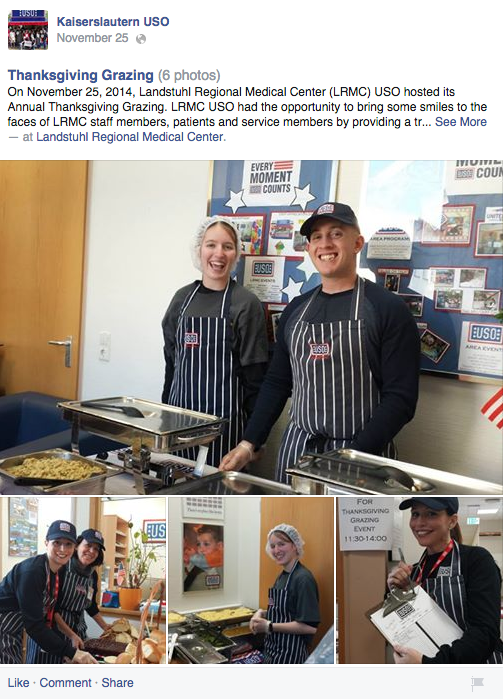 On Nov. 25, Landstuhl Regional Medical Center USO hosted its annual Thanksgiving Grazing event, bringing smiles to the faces of staff members, patients and service members by providing a traditional Thanksgiving meal to approximately 250 guests. Unsure if just one person can make a difference? 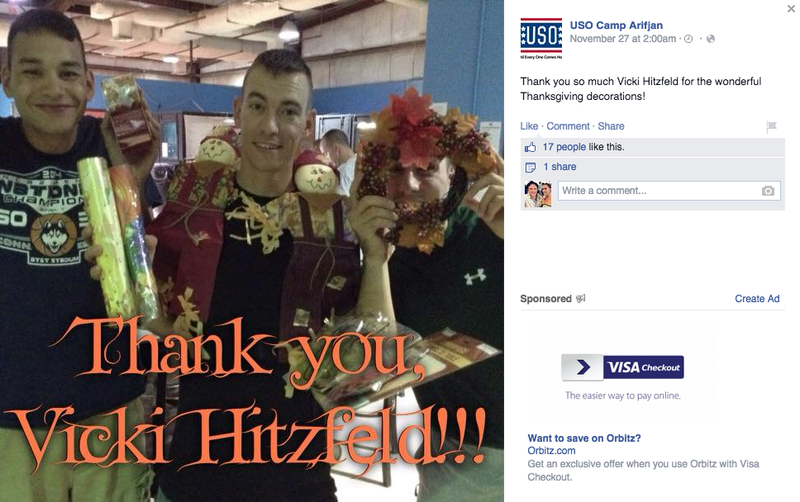 In Kuwait, it’s USO donors like Vicki Hitzfeld whose gift of Thanksgiving decorations made a huge difference for troops stationed away from home over the holiday. 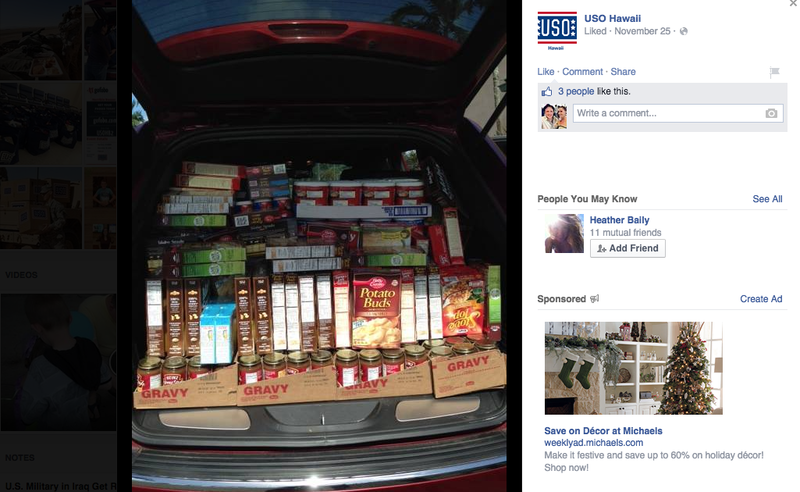 While the weather may not have a Thanksgiving chill at USO Hawaii, there’s no question what time of year it is judging by the supplies in stock via USO donors and volunteers. The World Series Champion San Francisco Giants brought home yet another big win for the troops. 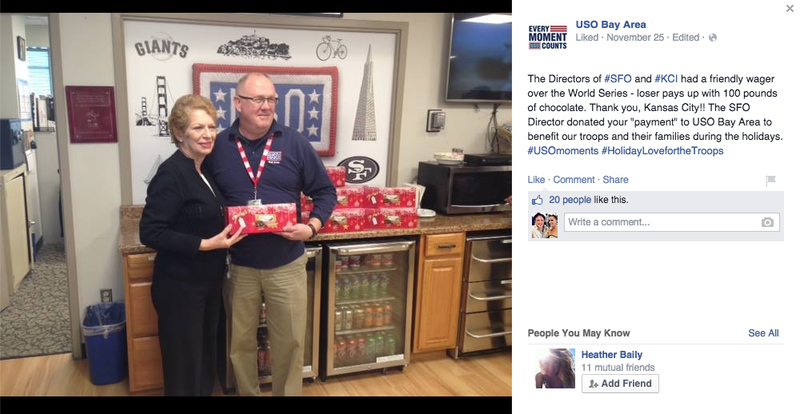 This week, the director of the Kansas City International Airport paid up on a friendly World Series wager with the director of the San Francisco International Airport – 100 pounds of chocolate for USO Bay Area! 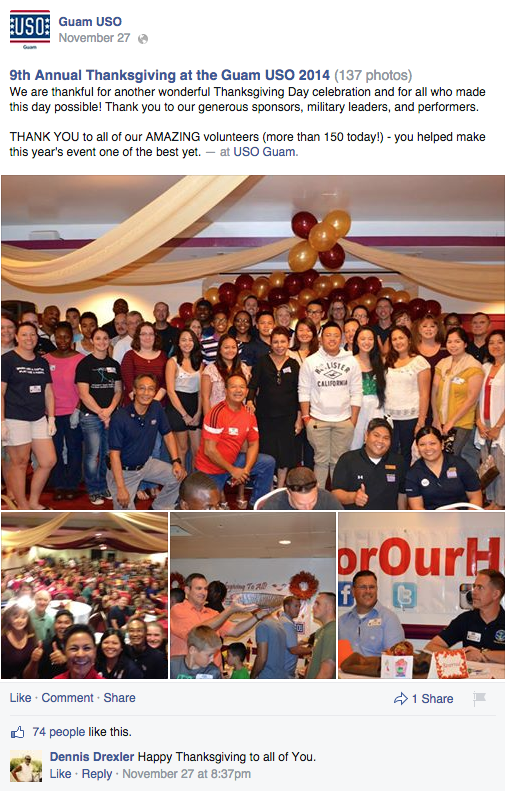 The 9th Annual USO Guam Thanksgiving Feast attracted a huge crowd this year. 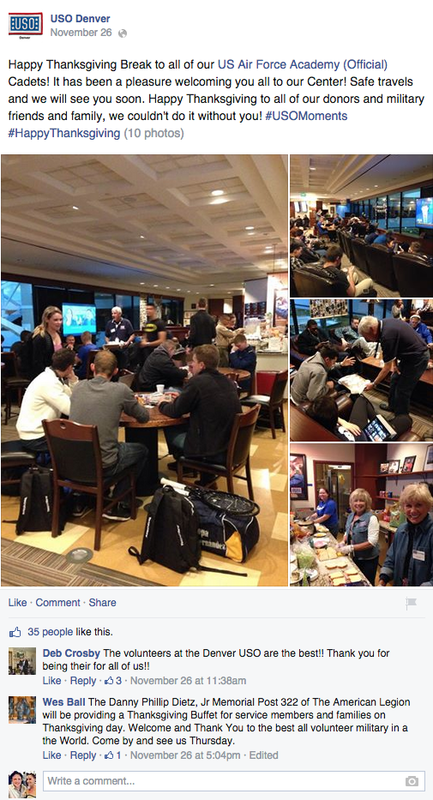 Look at all those hungry people waiting to dig in! 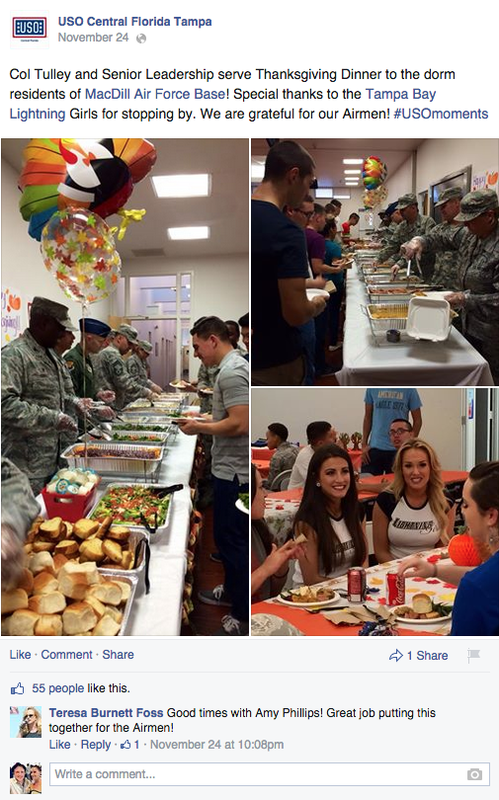 At USO San Diego, traveling troops and families passing through our airport center were treated to a full-on Thanksgiving feast. Follow this link to watch the local news coverage. 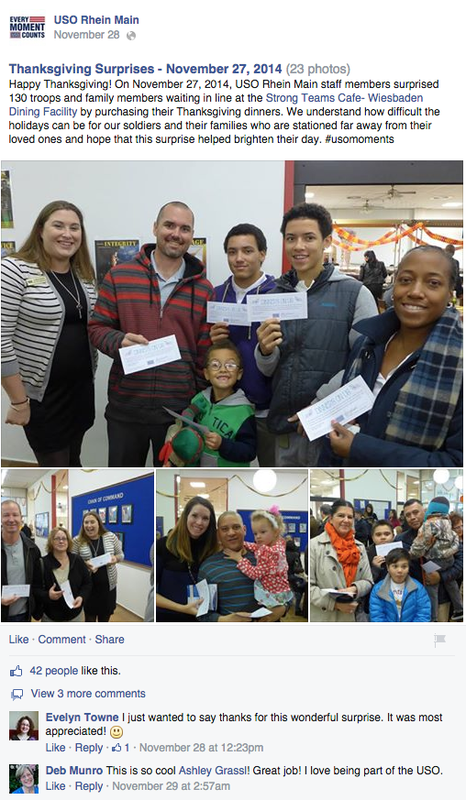 At USO Rhein Main, the staff surprised 130 troops and their families waiting in line at the dining facility with gift certificates covering the entire cost of their Thanksgiving meal. 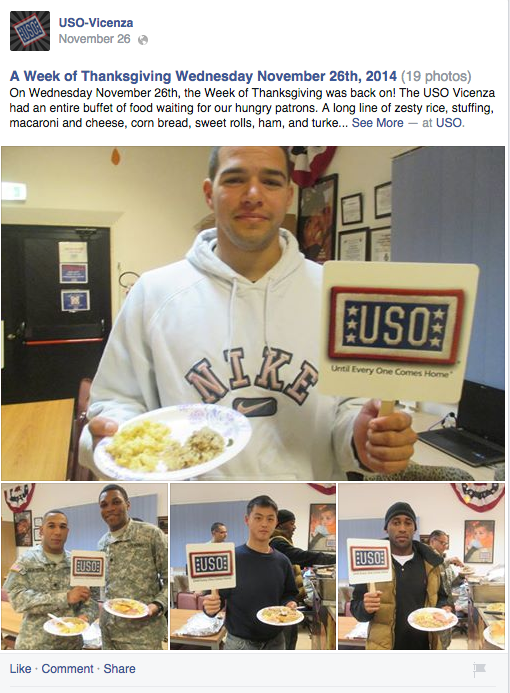 At USO Camp Hansen, troops lined up for a free meal on Thanksgiving Day. 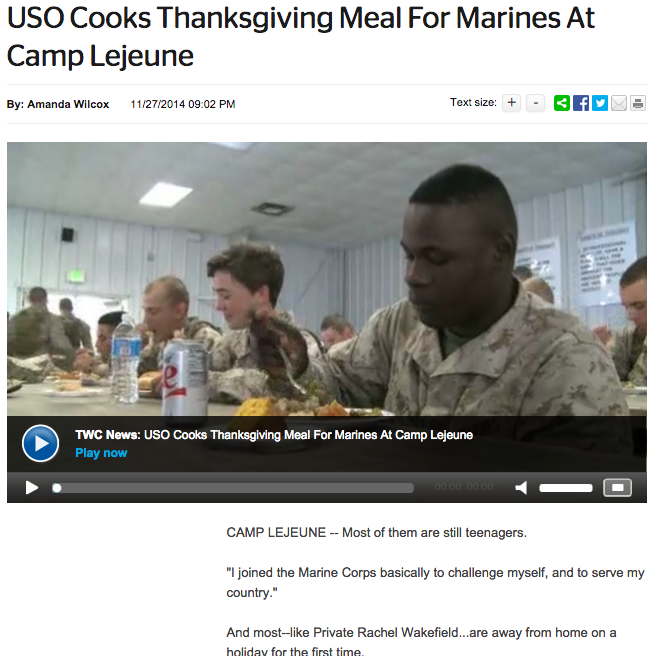 The homemade food provided by the USO was served to service members who are thousands of miles away from home. 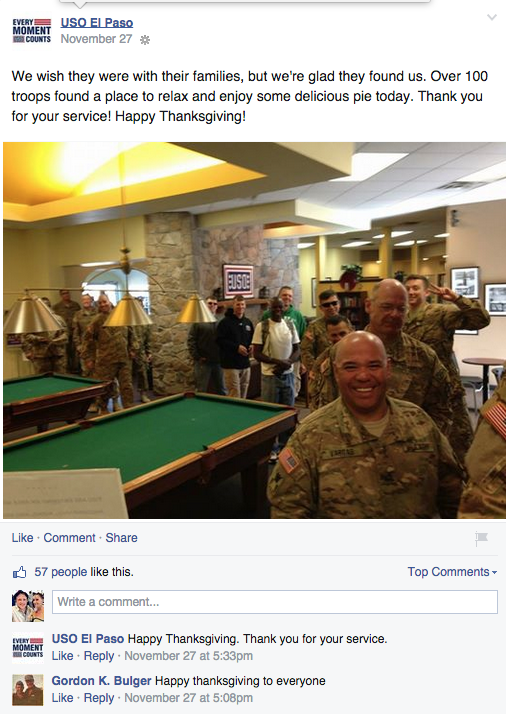 Follow this link to see a great video about how the USO of Northern Florida fed as many as 2,000 troops! 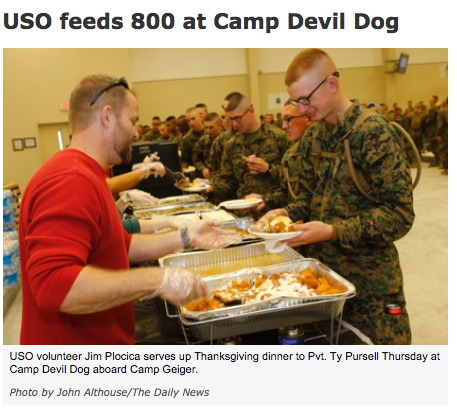 With several military bases in the North Carolina region, there’s a whole lot of mouths to feed. 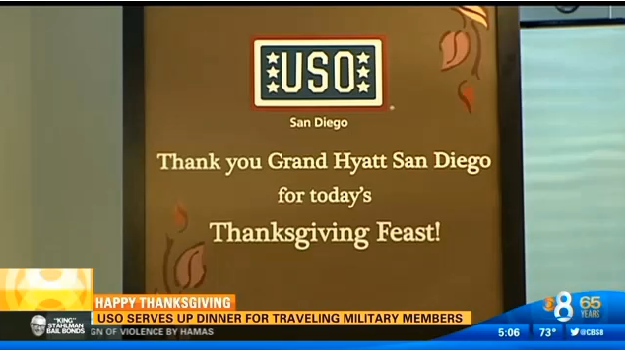 Fortunately for the troops, there are a lot of USO volunteers who made sure none of them went hungry this Thanksgiving. 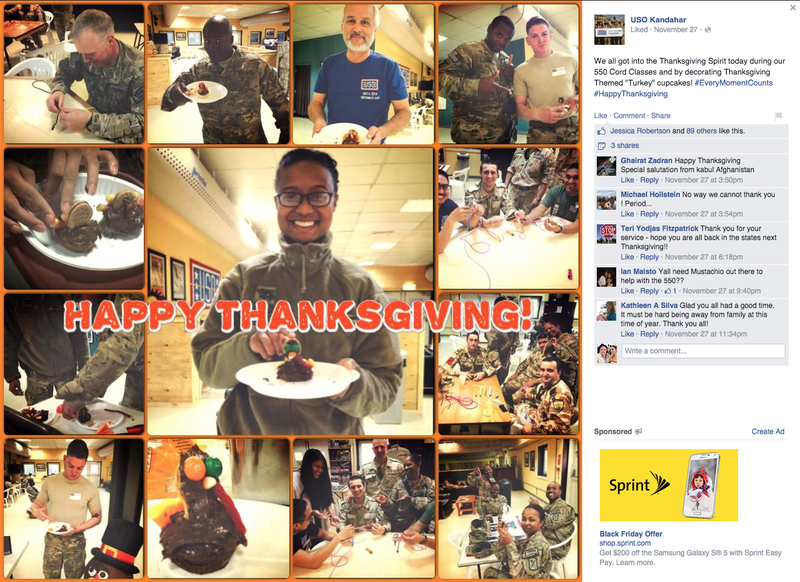 Thanksgiving activities have been taking place for weeks in the Washington area, from formal dinners at each of the Warrior and Family Centers to Thanksgiving care packages sent out to troops in myriad locations around the globe. 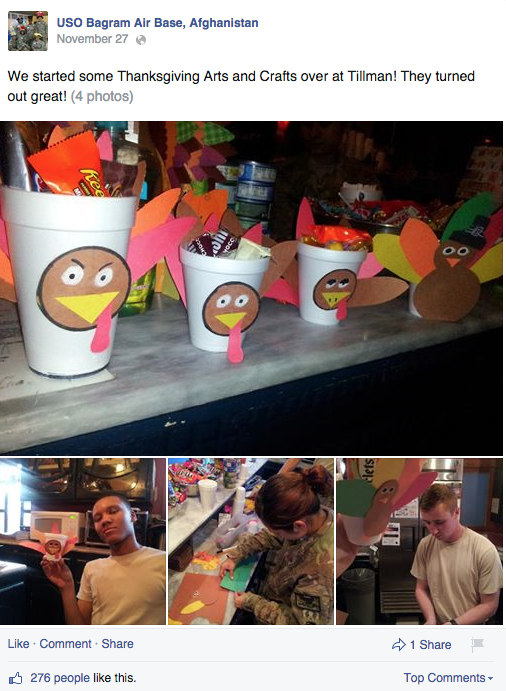 Here’s just a few of the many troops who received Thanksgiving gift baskets from USO of Metropolitan Washington-Baltimore. 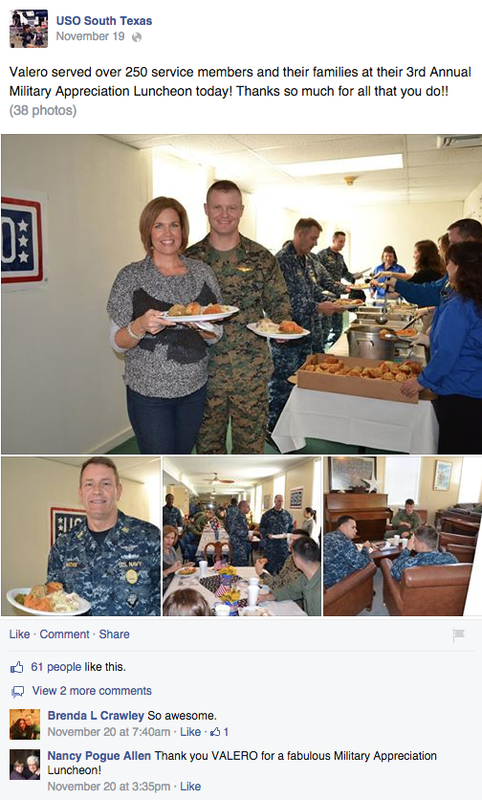 USO Vicenza had an entire buffet waiting for their hungry patrons. A long line of zesty rice, stuffing, macaroni and cheese, corn bread, sweet rolls, ham and turkey stood in front of them, and they didn't waste a minute before devouring it. Everyone dug in and left with full stomachs. By the end of the night, the only evidence of food left was two lonely turkey wings. 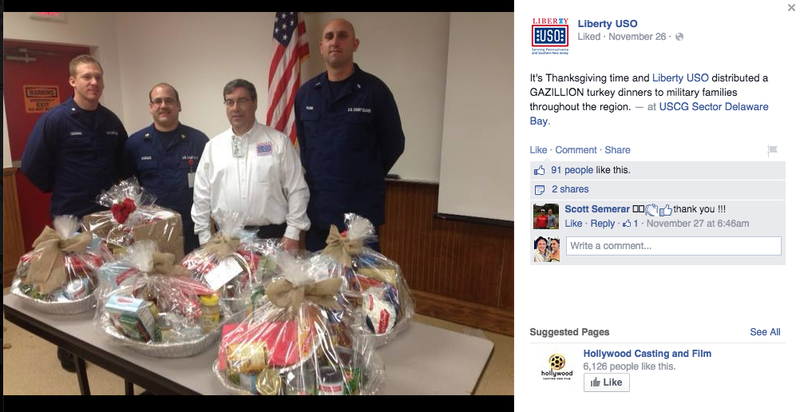 In Dallas, the Gary Sinise Foundation joined with the local USO to host a Thanksgiving Dinner!